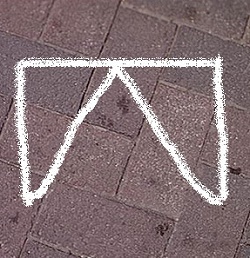 Have you ever spotted any strange chalk marks outside your own property or elsewhere? 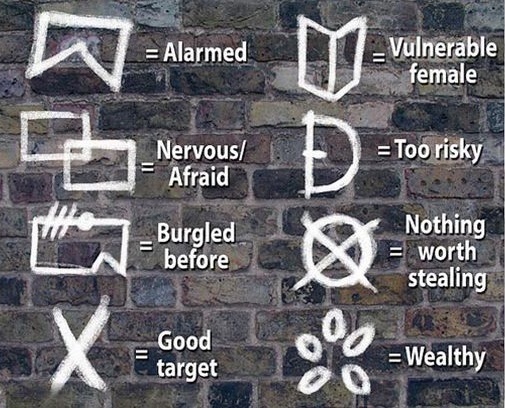 West Yorkshire Police believe that burglars are placing marks outside properties that give them key information they can use on their return. They have dubbed this the ‘Da Pinchi’ code. Back in February we warned of thieves using marks when targeting homes for dog thefts but it would appear that it’s a much wider issue. These marks are not as simple as a mark for ‘yes, good target’ or ‘no, don’t try’; there are a range of marks that denote a great deal of information about the property and its occupants. You can see some of the symbols here. They include everything from ‘alarmed’ and ‘too risky’ to ‘vulnerable female’ and ‘good target’. It is, however, interesting that there is a symbol to indicate that the property has a burglar alarm – showing that this continues to be a deterrent to intruders. If you have any concerns about the security of your home get in touch with us on 0800 612 9799 (from a landline) or 0345 833 5543 (from a mobile) or pop into our security shop for advice. next When the boss is away, who looks after security?